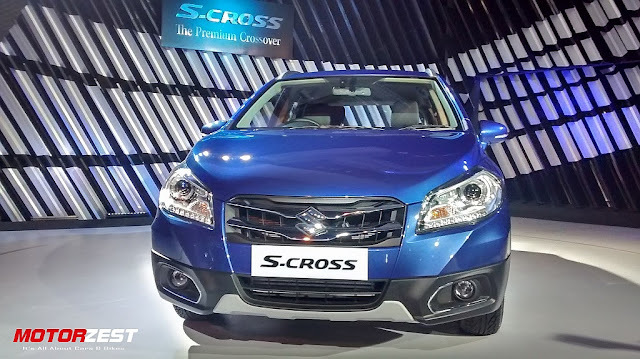 Market leader Maruti Suzuki launched its premium cross-over - the S-Cross - in India at Rs. 8.34 lakhs (ex-Delhi). With the rapidly growing demand for such vehicles in India, it was time that Maruti rolled out its own cross-over. The crossover will be available exclusively at the NEXA showrooms, a new automotive experience launched by Maruti for its premium cars. Keeping in line with this premium experience the car had its grand introduction in New Delhi with an orchestra. 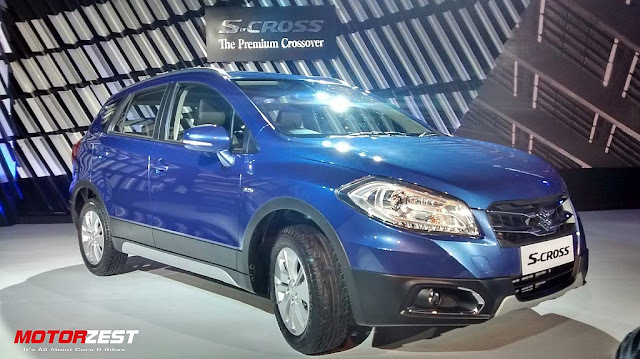 Keeping in line with the compact crossover size regime, the S-Cross measures 4300mm in length and has a width of 1765mm. The exteriors are in sync with the current Maruti designs, having dynamic and prominent character lines and somewhat aerodynamic features and has the muscular look that is demanded from a cross-over. There is a very prominent Suzuki ‘S’ badge on the front grille under the raised bonnet. To accentuate the crossover look, the S-CROSS has been provided with steel roof rails and wide wheel arches. What surprised us was the good quality rubber insulation and the covering up of the otherwise exposed metal around the doors keeping in mind the premium look. At the back, the first thing that was noticed was the well cushioned seats. Maruti has done a commendable job getting the perfect balance of comfort required in a car for long as well as leisure drives, unlike some of the low cost carriers these days. On top of it there is a 2-level seat adjustment available for the rear seats, for that extra recline that one may want. There is also ample leg room anf head room for a 6 foot tall person. What the S-Cross loses out on are the rear ac vents, which has now become a standard even in non-premium cars and also rear reading lights. The front seat of the car is where one wants to be. The center console packs a multi-information display, an inbuilt navigation system and smart play infotainment system along with all door speakers having a decent oomph. The infotainment system does however take some time getting used to, especially with regard to the voice recognition system onboard. The car sports a twin dial instrument cluster and steering mounted audio and Bluetooth controls. What we noticed was that all the plastics that were under frequent contact felt and looked premium, like the air-conditioning vents, the ac adjustment knobs, the steering wheel and the gear knob. However the plastics that had less or irregular contact from passengers, such as the dash, only looked premium and didn’t feel premium, also at times a little shaky. The major disappointment came however with a pretty much wobbly glove box. But these issues may be limited to that particular unit. Other features available in the cabin are- height adjustable seat-belts for the front seats, dual lights in the front and drop down holder for your eyewear. A charging port is also available in the central console and a small storage space. The armrest extends out enough to give some support to the elbow but is narrow and two people might fight for space. It also opens up to a small storage space and comes with an AUX and USB port. Cup holders were altogether absent from the front for some reason, the doors however, had angular- bottle storage spaces. Ingress and egress was easy from both, the front and back seats and the doors opened up quite wide. The seating position was good and assisted by the height adjustable steering wheel. Under the hood, Maruti provides us with two engine options, both of which are diesel engines and have manual transmissions. The DDiS 320 delivers 320Nm of torque @ 1750rpm and comes with 6 gears while the DDiS 200 delivers 200Nm of torque at the same rpm and has 5 gears. The 200 claims a fuel efficiency of 23.65kmpl while the 320 claims 22.70kmpl. for a crossover the 320 has a good sprint to 100 in 11.3 seconds whereas the DDiS 200 clocks in at 13.2 seconds. Both these engines are also powered by the Variable Geometry Turbocharger(VGT), that provides for optimal forced induction by controlling the flow of exhaust in accordance with the car’s speed which results in a continuous and fuel efficient supply of torque, even at low rpms. The car is made with High Tensile Steel using Suzuki’s TECT concept and has an all-wheel disk brake with ABS setup. The front seats have pre-tensioners and force limiters and most importantly, it has dual airbags as a standard even on their base model. For the not so parking connoisseur, it also comes with reverse parking sensors and a display. The DDiS 200 will be available in 4 variants. The Sigma would be the base model and would be priced in the range of Rs 8,34,000 and will be followed by Delta, Zeta and Alpha, which would be the top end model, priced at Rs 10,75,00. The DDiS 320 will come in 3 variants, Delta Zeta and Alpha. Starting at Rs 12 lakh and Alpha topping it at around Rs 13,74,000.